All of the sweet treats you would like to eat and then some. 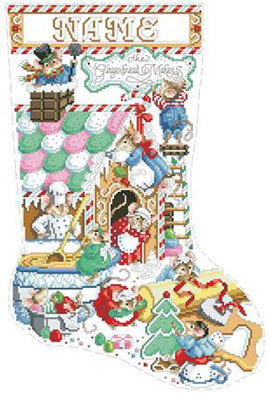 Busy little mice are decorating for Christmas on our Gingerbread Mice stocking. Our classic stocking comes with alphabet and directions for assembly. Each PDF download includes a large full color image, chart, DMC floss color guide and general instructions / stitch guide. A chart for personalization is also included. Contents: Stitch Count 149w X 219h, Finished Size on 14 ct:10 1/2" x 16"